"It is time to shift the focus on nutritional food security as it is the nucleus of Food Security Bill, aimed at providing food security by providing nutritious food," says Dr RB Singh, President, National Academy of Agricultural Science, has said. Though a small election for a municipal councillor, the bypoll for ward 8 of Sirsa Municipal Council slated for September 17 has assumed larger importance due to the active interest shown by all political parties. MP Ashok Tanwar inaugurates the election office of Congress- supported candidate Suchet Kaur Brar for municipal bypoll at Sirsa on Saturday. Mewat is probably the most backward area in the state, but it has a well-organised abduction industry, which has forced the district and Rajasthan police to remain on their alert.Banking on the rampant unemployment in the district and adjoining areas of Rajasthan, the kidnappers have set up "mini call centres" to lure people to secluded places on pretext of a job and then abduct them. Sirsa is one of the two districts of the country, the other being Sitapur in Uttar Pradesh, where the British Council (BC) has started a programme to hone the communication skills of local youth in English. “High-Density Planting”, a new system of cotton plantation taken up by the Central Institute of Cotton Research (CICR) on a trial basis this year is likely to bring a revolutionary increase in the productivity of cotton in the country from the present national average of 500 kilogram lint per hectare, which is currently much less than the world average of 750 kilogram lint per hectare. Failure to achieve the Remittance into Banks (RIB) targets set by the power utilities has put more than 46 senior officials of the UHBVN and DHBVN in the dock as they are all set to face the music. The power authorities have charge-sheeted them. Dr VK Katyal, a senior professor of medicine at PGIMS in Rohtak, has been selected for a coveted international fellowship of the American College of Cardiology. He has also been granted permanent membership of this society. Martyr Bhagat Singh’s nephew and a Ludhiana-based retired professor, Jagmohan Singh, said women played a vital role in the India’s freedom struggle. Prof Jagmohan Singh delivered a lecture at the Government Post Graduate College for Women, Bhodia Khera, Fatehabad, during a workshop, organised by the women wing of the college. Taking a leap ahead in bridging the gap between poor and rich devotees who undertake pilgrimages of famous gurdwaras for paying obeisance, the Shiromani Gurdwara Parbandhak Committee (SGPC) will soon provide facility for free 'yatra' to poor Sikhs to visit the historic gurdwaras falling under Section 85 of the Sikh Gurdwara Act 1927. 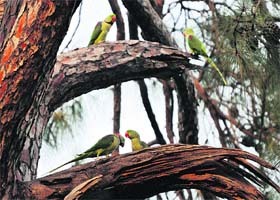 Notwithstanding the claim of the Haryana Government to increase the forest cover to 20 per cent by 2020, the area under forests is gradually squeezing due to the diversion of forest land for non-forest activities, mostly in violation of the Forest Conservation Act, 1980, which makes it mandatory for states to get a prior approval of the Centre for the change of land use. Ambala Deputy Commissioner K Makrand Pandurang along with officials of the district administration and the MC visited the garbage plant at Patvi village and asked the company officials assigned the task to start it at the earliest. He said if the company did not start the work immediately, then the work should be allotted to some other company. A seminar on create social awakening about eradication of menace of corruption was organised at Panchayat Bhawan here recently. On the occasion, Manbir Singh Sheoran, SP vigilance bureau of Ambala region said social organisations should come forward to extend their cooperation and help in eradicating corruption from the society so that the common man could get relief. The district administration has completed all arrangements for depositing the cash subsidy of gas cylinders in the bank account of the consumers from October. While addressing officials and dealers of gas agencies at Vikas Sadan, Deputy Commissioner K Makarand Pandurang said initially the scheme was being started in Ambala, Sonepat, Panchkula, Kurukshetra, Karnal, Kaithal and Faridabad districts of the state. 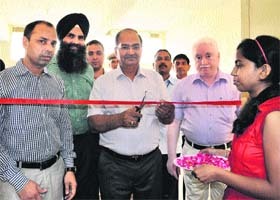 Mohinder Kumar, Vice-Chancellor of the Deenbandhu Chhotu Ram University of Science and Technology in Murthal, inaugurated an orientation programme on UGC-funded free remedial coaching classes for Scheduled Caste, Scheduled Tribe, OBCs and minorities. The herds of stray animals moving on the roads have become a problem for the residents of Kaithal town. The residents of other adjoining towns namely, Pundri, Cheeka, Kalayat and other rural areas were also facing the same problem. Besides spreading filth, the animals are the major reason behind some serious fatal road accidents. Nine Universities of India, having strong programmes and base of the Geo-spatial Information Systems (GIS), have inked a Memorandum of Understanding (MoU) to form an Inter-University Consortium on Geo-spatial Information Systems (IUCGIS). Raah Group, a prominent non-governmental educational organisation in Haryana, will hold a state-level talent search contest, mainly for school students. Furnishing details in this regard, Naresh Selpar, managing director of the Raah Group, said the talent search contest had been classified into three categories i.e. the sub-junior group which would comprise students of Classes VI, VII and VIII, the junior group which would consist students of Classes IX and X and the senior group which would consist students of Classes XI and XII. A workshop on stocks and share market was organised by Infrastructure, a society of civil engineering students, at the National Institute of Technology (NIT), Kurukshetra, here recently. Sunil Miglani, director of Skill Track, was the resource person for the workshop. Chaudhary Devi Lal University, Sirsa, released its sports calendar at the 13th meeting of the Sports Council held here recently and its affiliated colleges have been entrusted with the responsibility to organise inter-college competitions in 40 sports disciplines. The Balmiki community, which has remained oppressed for centuries and at the lower rung of society, is making efforts to better their lot. Young boys and girls from the community are breaking the century-old shackles and are trying to transform their lives through education. Kendriya Vidyalaya No1 in Ambala, organised an exhibition to commemorate the golden jubilee of the institution. Kendriya Vidyalaya is among the 20 regimental schools taken over by the Kendriya Vidyalaya Sangathan (KVS) in 1963. Gurgaon District Magistrate Shekhar Vidyarthi has invoked Section 144 of the CrPC for getting verification of tenants and domestic helps done. District Magistrate Shekhar Vidyarthi has invoked Section 144 of the Criminal Procedure Code 1973 for prohibiting the use of crackers at parties, celebration in lawns or gardens and on the roads, lanes and bylanes in the 900-metre restricted area around the 54 ASP, Ammunition Depot, Gurgaon. Padma Bhushan awardee Dr Singh, who was chief guest at the foundation day of the Directorate of Wheat Research (DWR), Karnal, said that "at present we are producing 255 million tonnes of foodgrains every year and at the same time losing 4 per cent of our GDP on combating the effect of malnutrition among the masses but still 40 per cent of our children are undernourished and suffering from malnutrition." In such a scenario, it was imperative to add comprehensive nutritional value to food to ensure that no individual was undernourished and the objective of the Food Security Bill was achieved. Referring to a question relating to large-scale suicides by farmers under debt in various parts of the country, he said raising the income of farmers was essential for which increase in production, productivity and crop yields was required. Besides, announcement of minimum support Price (MSP) at the right time, price mixing and advancing interest-free loans to farmers like in Maharashtra can help the farmers to get remunerative returns and save them from falling into a debt trap, he observed. All major political parties -- the Congress, the INLD and the HJC-BJP alliance -- have fielded their candidates, though not on party symbols. The election has been necessitated due to the resignation of the INLD councillor, Namita Kamboj, after she got government job of a school lecturer in Political Science. In this byelection, the INLD has fielded Namita’s mother-in-law Jinda Bai as its candidate, who is contesting on the symbol of umbrella. The Congress, which seemed faction-ridden in Sirsa in the past, has been able to cobble together its different groups together for this bypoll. 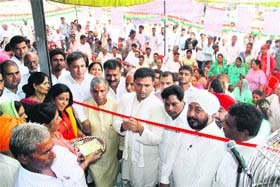 When Sirsa MP Ashok Tanwar inaugurated the election office of Congress-supported candidate Suchet Kaur Brar today, party leaders Hoshiari Lal Sharma, Malkiat Singh Khosa, Bhupesh Mehta, Naveen Kedia and Shilpa Verma, district president of the Mahila Congress were present. Brar’s publicity material shows the photographs of former minister Gopal Kanda besides Congress leaders Sonia Gandhi, Manmohan Singh, Rahul Gandhi, Bhupinder Singh Hooda, Phool Chand Mullana and Ashok Tanwar. Suchet Kaur Brar is contesting the poll on the symbol of car. The BJP-HJC alliance has fielded Rajbir Kaur Brar who is contesting the poll on symbol of train engine while Sangita Sachdeva, a candidate fielded by former minister LD Arora’s daughter, Sunita Setia, is contesting the bypoll on the symbol of aeroplane. Also in the fray is Manju Bala, an Independent contesting the election on the symbol of rising sun. Battle lines had been drawn and all candidates as well as the leaders supporting them have been leaving no stone unturned to win the bypoll. While the INLD is campaigning hard to retain the seat vacated by the party’s councillor, others have been making all efforts to win this bypoll ahead of the Assembly poll slated for next year. To ensure their success, these kidnappers have employed woman from across the district to make these calls. So far in more than 50 such instances, the accused have been found to be of Mewat. Many incidents have been reported from the areas like Alwar, Bharatpur, Dholpur and villages, including Gopalgarh, Pahari and Ladamkha ,” said a senior official of the Rajasthan police. The latest incident came to light on Sunday night when the Alwar police found three missing persons Idu (35), Nishad (28) and Kalu (32). One of the three victims was going to buy a tractor on August 27 and got a phone call in which a woman said she had a very good business plan for them in the real estate sector. She lured them to a secluded palce. They were kidnapped near Bharatpur. They lost several lakh rupees and an SUV in the incident. “There are at least six cases in which people were kidnapped in a similar manner. The criminals are targeting the people who have either recently sold off their land or looking for a business or job and are ready to pay for the same. The accused are generally from Mewat," said Suresh Yadav, Station House Officer of the sadar police station, Alwar. The council’s first two centres of this district were inaugurated in Kharia and Ludesar villages recently by Avantika Maken Tanwar, wife of Sirsa MP Ashok Tanwar, in the presence of Alison Barrett, Director, English for Education System of the BC for South Asia, and Reesha Alvi, Project Director, Delhi. The project is funded by the European Union. Speaking on the occasion, Avantika, who is also the chairperson of Lalit-Geetanjali Foundation, an NGO named after her parents, said a workable skills in communicative English was essential for success in any field today. She said youth hailing from big cities were at an advantageous position than their counterparts in villages and small towns like Sirsa because the former had better communicative skills in English. She said her husband Ashok Tanwar had a plan to set up 18 skill development centres in villages of Sirsa and programme of the British Council would be started at all such centres. Youngsters in the age group of 16 to 35 will be able to get training in spoken English at these centres. The course is of 120-hour duration, said Sakha Ram, coordinator for skill development centres. Hemant (23), who completed his four-year engineering degree from a private college in the state, said training in communicative skills from the British Council centre would enhance his confidence and enable him to compete with others. The CICR has set up 2,600 demonstration plots, covering 37 districts of the country under the “High-Density Planting” that involves closer spacing of cotton plants from the present 67.5 cm (row to row) X 60 cm (plant to plant) to 67.5 cm (row to row) X 10 cm (plant to plant). While in the current 67.5 cm X 60 cm system, the number of plants is 2,4691 in one hectare, by close spacing it will change to 67.5 cm X 10 cm system. The number of plants increases to 14,8148 in a hectare of land. Increased number of plants and hence bolls automatically lead to increased productivity of the crop. Twelve such demonstration plots have been set up in seven villages of Sirsa, the district that counts for almost 40 per cent of the cotton produced in Haryana. “India stands at number one in the world as far as the area under cotton is concerned and it is second to China in the matter of total production and total export of cotton. But, when it comes to productivity per hectare, our country stands at the 24th position in the world with even Pakistan having better productivity,” said Dr Dalip Monga, a Principal Scientist and Head of Sirsa-based regional centre of the CICR. By adopting the “High-Density Planting” technique, farmers will be able to increase their productivity by raising the number of plants and bolls per hectare. Dr Monga said much would depend on how the new technique worked when taken up at a larger scale. He was confident that the world average of 750 kilogram lint per hectare could be easily surpassed. “Most of the 2,600-odd demonstration plots have been set up for trials in the central and southern India, while in Sirsa, such plots have been set up in Begu, Fatehpuria, Mohammedpuria, Rangri Khera, Sawantkhera, Bhuna and Bakrianwali villages," said Dr Monga. The “High-Density Planting” trials are on normal varieties of cotton and not on the Bt varieties at present in vogue. Dr Monga said with the productivity of Bt cotton being stagnant for the past many years and rather on decline after reaching a peak, normal varieties were likely to make a comeback. Well-placed sources in the power utilities said as many as 26 officials of UHBVN and 20 officials of DHBVN have come in the line of fire for not performing well over the past two months and having failed to generate revenue in proportion to the power supplied by the utilities. The sources said this year the state power utilities supplied record power to the state consumers of all sectors for which elaborate arrangements had been made by the power utilities. However, the recovery of bills remained far below expected and as the matter was looked into, it was found that officials posted at various subdivisions and district headquarters had not been able to recover the power bills. It was learnt that the state power utilities had singed a long-term purchase agreement to buy around 1,400 MW of power, which had helped the utilities tide over the power crisis in the state this year. The utilities require making payment for it and under recovery of the bills was posing a problem to the authorities. The sources said revenue generation had fallen short by 25 to 30 per cent in various subdivisions of the state. Meanwhile, the CMD of the state power utilities, Devender Singh, said the work of all officials was being assessed keeping in view their performance and score cards based on increase in revenue realisation, recovery of defaulting amount, detection of cases of power theft and quick disposal of complaints. He said these parameters would be used to assess the efficiency of officials. Dr Katyal has been selected for the fellowship after a tough international competition. He is one of the three specialists selected from India. The award will be conferred on him at the 63rd annual conference of the American College of Cardiology at Washington DC shortly. The American College of Cardiology is an international organisation, engaged in education, research development and execution of guidelines in the field of cardiology. Prof Katyal is head of a unit at the Department of Medicine at PGIMS. He is also the in charge of ICCU and Non-Invasive Cardiac Lab managed by the department. He also runs a cardiovascular clinic. He has got 85 papers published in the national and the international journals. His research, coupled with clinical work in the field of cardiology of nearly three decades, was the basis of his selection for the fellowship. Dr Katyal is already a member of the European Society of Cardiology. He was awarded the fellowship of the Cardiological Society of India last year. In all, this was the fifth fellowship won by him, the other four being national fellowships. Dr RK Sharma, Principal, Dr Meet, head of the women wing of the college, also spoke on this occasion. Dr Laxmi Narain, Dr Sita Ram and several others were present on this occasion. “We trace our struggle for freedom to 1857, when thousands of women participated in the revolt by taking swords in their hands. Since then, women participated in the freedom struggle in direct or indirect manner from time to time,” said Jagmohan Singh. Bhagat Singh’s nephew said the fact that Netaji Subhash Chander Bose constituted a women wing of his Azad Hind Army and named it after Jhansi Ki Rani Laxmi Bai itself spoke about the women’s contribution in the freedom movement. He said when the revolutionaries were fighting against the English regime, women provided strength to their families at home. Later, speaking to The Tribune, Jagmohan Singh traced a link between Bhagat Singh and Subhash Chander Bose. He said the second part of Bhagat Singh's famous "Letter to the Young Political Workers" had revealed a relationship between him and Netaji Subhas Chandra Bose. Jagmohan Singh has traced the document's journey from Lahore to Bengal. The document contains notes entitled "Our Opportunity", "Gandhism", "Terrorism"and "Revolutionary Party". He said the document must have been with Bose, and that is why it was recovered from Bengal. "The trail of the document draws our attention to the fact that how less we understand Netaji. We need to understand Bhagat Singh and him together now," said Jagmohan Singh. "The decision is a historic one, as such an initiative has been taken for the first time and there are around 100 historic gurdwaras for which the SGPC will provide free transport," Senior Vice-President of the SGPC Raghujit Singh Virk said recently. Every devotee will be able to pay obeisance to the Guru in the Guru Ghar and we will start buses for the needy, the poor (below poverty line) and the disabled who want to visit the Sikh shrines but cannot afford it due to lack of resources, Virk said. The initiative will be started in Haryana and Punjab and the proposal will be finalised at the SGPC executive meeting next month and the buses will start from November. The Golden Temple, Talwandi Sabo, Anandpur Sahib, Patna Sahib, Hajoor Sahib and Nada Sahib are some of the gurdwaras that the poor would be able to visit. A committee will be constituted to fine tune the plan and initially the bus services will be operated on a weekly basis, Virk said. Though the Act reduced diversion of forest land, the forest area, which was more than 1.75 lakh hectares at the time of the commencement of the Act, has further decreased by 5 per cent over the years. The main reason behind the gross violation of the Forest Conservation Laws is that the fine or punishment for various offences could not prove to be a deterrent as these were fixed in 1927 during the British rule. The forest laws are being violated with impunity as fine for an offence under the Act is still Rs 500 and the imprisonment is just just upto six months. The Forest Department has already sought suitable amendments to the Law by increasing the minimum fine to Rs 50,000 for the illegal felling of trees and smuggling of forest produce. The imprisonment sought by the department is upto two years. "Due to a steep increase in the value of forest produce in the recent years, the fine of Rs 500 has no relevance. Besides increasing the punishment, a provision should also be made in the law for seizing the produce and impounding vehicles," Principal Chief Conservator of Forest CR Jyotriwal said. Earlier, Chief Minister BS Hooda had announced an ambitious scheme to plant trees on farmers' land with their concurrence at a state -level Vanamahotsava function in Karnal in August 2010 as no government land, along the highways, was available for plantations to achieve the target of 20 per cent green cover. As per the 2011 India State of Forest Report, forest cover in Haryana is 1,608 sq km, which is 3.64 per cent of the state's geographical area, and the tree cover is 1,395 sq km, which is 3.16 per cent of the total geographical area. The combined forest cover and tree cover is 6.80 per cent of the total geographical area. The data compiled in the study report for the period 1999-2012 shows a massive increase in construction activities in the NCR districts of Haryana, which have the highest concentration of land under built-up area, which is pegged at 35.46 per cent. The built-up area here grew from 93,996 hectares to 1.32 lakh hectares in the past 13 years, survey stated. The report also pointed out that the increase in the built-up area mainly came from the conversion of agriculture land, green areas, water bodies and waste land and due to the absence of proper legislation to control land use in the agricultural zone (rural). He said that all disputes regarding the plant had been resolved and now there was no difficulty in starting work. He further said that the administration had applied for the clearance certificate from the Union Environment Ministry for the plant and it would be issued soon. He said with the starting of this plant, the garbage problem of the people of Ambala city and cantt would be resolved. Before this, the DC visited the place near Indian Oil on the GT road where the garbage is being disposed of at present. He asked the officials to construct a wall so that garbage was not visible to the passersby on the GT road. The DC also visited Nadi Mohalla, MDSD College and inspected roads and directed officials to repair roads which needed small repairs and construct with concrete and cement those which were in a bad condition. The garbage plant was got sanctioned with the help of Union Minister Kumari Selja but due to legal hurdles, the work had remained suspended for the past three years. The DC also instructed the MC officials to remove encroachments from the main roads and requested the shopkeepers to remove their belongings from the government land. He said those who have encroached on government land should remove these illegal structures. He said causing unnecessary delay in doing official work, manipulation in the official records to gain monetary benefit, demanding money for doing official works and denial to provide official documents, were some of the acts which amounted to corruption and invited strong action and punishment under the Anti Corruption Law. Any one becoming victim of red tapism should approach the Vigilance Department. He said contact numbers of the Vigilance Department will be pasted in all the government offices shortly, to enable the aggrieved persons to get in touch with the Vigilance Department authorities. He said his department would take strong action against the officials, if an information about the use of substandard material in the construction of the government projects was received. He informed that the success rate of the conviction in the graft cases was 55 per cent. Representatives of various trade, commerce, social organisations, senior citizens and anti-corruption bodies were among those who forwarded their suggestions to eradicate corruption from the society. Shamsher Singh, Inspector, local vigilance office said their efforts will continue to take strong measures to eradicate corruption and ensure complete transparency in the services provided to the public by the government offices. The DC said the gas dealers had a relevant performa for taking benefit of the scheme. Besides, consumers of gas cylinders could give their names, gas consumer number, bank account and Aadhar card numbers on a white paper. He said it was mandatory for the consumers to add the Aadhar number with the account number. He directed the gas agencies that in the case of those consumers who had deposited their Aadhar number with them, they should forward these to the Lead Bank Manager through the District Food and Supplies Controller and the banks would add these to the accounts of the consumers. He said those consumers whose Aadhar cards had not been received should give their Aadhar number slips to the gas dealers who will themselves get them registered after checking from the Internet. They could also check them at the District Information Centre in the mini-secretariat free of cost. He asked the people to get themselves registered or they would not be able to avail themselves of the benefit of the gas subsidy. The DC said in order to streamline this work, a committee headed by the SDM had been constituted with the DFSC and the DPRO as its members. Mohinder Kumar, Vice-Chancellor of the Deenbandhu Chhotu Ram University of Science and Technology in Murthal, inaugurated an orientation programme on UGC-funded free remedial coaching classes for Scheduled Caste, Scheduled Tribe, OBCs and minorities. The event was organised by Chhotu Ram Chair for Sustainable Development on the university campus recently. “Knowledge is the foundation of success. Knowledge comes from hard work, dedication and commitment and such efforts never desert a person in the life. There is hardly any problem which cannot be solved," said Mohinder Kumar. He said the aim for providing coaching and training facilities free of cost was to ensure that the students of these categories were not deprived off such facilities for want of financial resources. He also exhorted them to avail the opportunities for achieving their targets in life. He pointed out that with such facilities, the number of qualifiers in the central civil services from Haryana had increased from one or two in early days of the state to 12 in 2008 and 44 in 2012. “The students should keep in mind that there is hardly any retake in the life and the opportunity should not be missed,” he advised. Prof JS Rana, Deputy Registrar Narender Hooda and Research Associate Sonia Malik were also present on the occasion. The municipal council and the administration had failed to take an action to check the menace of stray animals. Despite repeated government announcements to check the presence of stray animals on roads, the problem still continues to aggravate. On some occasions in the past, the municipal council on the directions of the then deputy commissioner, launched a drive to check menace of stray animals and a large number of animals were sent to the nearby "goshalas". The residents have demanded that the government should solve this problem at the earliest. NK Solanki, Deputy Commissioner, said he would soon issue directions to the civic body to take appropriate steps to solve the problem. The MoU was signed by the vice-chancellors of partner universities, Jawaharlal Nehru University, Guru Nanak Dev University, Kurukshetra University, Pandit Deendyal Petrolium University, Gandhinagar, and Universities of Kashmir, Pune, Goa, Hyderabad and Madras at the JNU campus in New Delhi recently. Prof MS Jaglan, of the Department of Geography, would be the focal person to co-ordinate the activities carried out under the aegis of the consortium at Kurukshetra Uuniversity campus. “The consortium on GIS will provide opportunity to the partner universities to make coordinated efforts for developing the GIS based teaching, research and solutions to various problems of governance, land and water conservation, land use and land acquisition, crop yield predictions, urban and infrastructure planning, management of natural resources, monitoring and real time mapping of disasters and natural hazards,” said Jaglan. “IUCGIS envisages exchange of faculty and research scholars, information, geo-data base, research material and output among the universities for widening the arena of applications of the geo-informatics and remote sensing for the betterment of the society. It will also encourage the scholars to make concerted efforts for undertaking cutting-edge research aimed at an effective use of the GIS for developing decision support systems for wider applications and societal development,” said Prof SP Kaushik, Chairman of the Department of Geography, Kurukshetra University. The consortium aims at raising the financial resources, in addition to the resources of partner universities, from various national and international funding agencies as well as other donor foundations. The funds received from these agencies would be utilised for supporting the activities of the consortium for next five years, added Prof Kaushik. He said over 5,000 students of government as well as private schools of various districts of the state are expected to take the test. The talent search contest for students of Hisar, Fatehabad and Jind districts would be held on September 14, at the pronounced district wise examination centres. Whereas, students of Rewari, Rohtak, Sirsa, Gurgaon and Kaithal would be taking the test at the examination centres in their respective districts on September 22. Selpar further said the question paper for the examinees would consist of 100 objective type questions, pertaining to general knowledge, computer, science, current affairs etc. The duration of the test would be one hour. The registration fee for the exam was Rs 100. He said handsome cash prizes would be awarded to the top position holders in each of the three groups. All the examinees would be given the participation certificates. Besides, meritorious teachers would also be honoured. He is a renowned technical analyst in the field of shares and stock market and has been sharing his knowledge throughout the country for more than five years. He hosts two popular television shows on the ZEE Business, namely "Bazaar Shastra" and "Sher Bazaar". 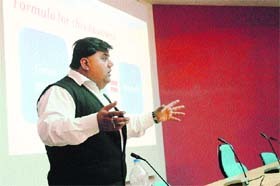 Prof Arun Goel, professor in charge, Infrastructure Society, said that in organising a workshop on stocks and shares, the society was going beyond civil engineering-related subjects so that all students of the institute could get a working knowledge on a subject related to current interest and significance. Miglani gave a basic understanding of the stocks and shares and how the market operates. He amused the audience and aroused their interest by describing the share and stock market as an art of a thief. While igniting the idea of bringing a prospective change in thinking and decision making process which may result in enhancing the understanding and performance in the world of stock and commodity markets, Miglani said, “It is not important whether you are right or wrong, what is important is that how much money you lose when you are wrong and how much you make when you are right." He told the students about the basic protocols of stock market, like how to invest, where to invest and how much to invest. “It is like being a juggler with too many balls in the air. You just drop one and you end up dropping them all," added Miglani. He explained that the art of money making from other sources is quite different from the art of money making from investments in shares or stocks as the former requires your hard work and dedication while the latter requires patience and observation skills. During the discussion round, Miglani also clarified the doubts of the audience. About 400 students attended the workshop. At a meeting of the Sports Council headed by the Vice-Chancellor, Dr Radhe Sham Sharma, it was decided that Government National College, Sirsa, would organise inter-college baseball, gymnastics and chess competitions whereas MM College would organise wrestling, football and kabaddi competitions. A spokesperson of the university said that Shah Satnam College for Boys would organise judo, taekwondo and swimming competitions. Government College, Tohana, would hold boxing, table tennis and kho-kho competitions, whereas the cricket tournament would be organised by Jan Nayak Chaudhary Devi Lal Vidyapeeth. Besides, CMK College, University Teaching Departments and other educational institutes would also organise inter-college competitions. Speaking at the meeting, the Vice-Chancellor said that apart from academic activities, sports activities would also be given priority as a sound mind lay in a sound body. He said there were ample job opportunities in the sports field. Therefore, better players would be prepared at the university level so that the identity of the university could be established at the national level. Instructors and coaches of the Physical Education Department would provide modern techniques to the players of the university, he added. Registrar Manoj Siwach, SK Gahlawat and Vikram Singh, both professors, Monika Verma and Ravinder Pal Ahlawat, both from the Physical Education Department and Principals DK Kaushik, Suman Gulab and Vijaya Tomar were among those who attended the meeting. The Haryana Balmiki Budhijivi Manch, an organisation of intellectuals from the Balmiki community, recently honoured nearly 200 brilliant students, who have done exceptionally well in studies. Gian Sahota, a member of the Haryana Teachers' Recruitment Board, who is also convener of the manch, gave away prizes to the children. A seminar on the topic “Balmiki Samaj: Shiksha, Dasha Avam Disha” was also organised on this occasion. Sahota said education was the thing that separated an empowered person from the powerless. “If our community is still being looked down upon by some sections of society, its major reason is that a majority of our children are still uneducated,” he said. He said it was a matter of pleasure that the people from all walks of life have joined the Balmiki Budhijivi Manch. Satyavan Dhilor, District Social Welfare Officer, Kaithal, Prof Naresh Kumar from Government Post Graduate College, Karnal, Shamsher Atwal, a chief manager at State Bank of India, Prof Virender Atwal and Ashok Sarbata also spoke on this occasion. The exhibition was inaugurated by Dr E Prabhakar, Joint Commissioner (P) of the Kendriya Vidyalaya Sangathan. Prabhakar along with other dignitaries lit the ceremonial lamp. The students presented a musical and rhythmic journey of the KVS. Brig Ashish Uppal awarded the winners and presented mementos to the alumni. Gurgaon District Magistrate Shekhar Vidyarthi has invoked Section 144 of the CrPC for getting verification of tenants and domestic helps done. In the orders issued here recently, Vidyarthi has directed the residents of the district, especially residents' welfare associations (RWAs) and controllers of housing societies, to furnish the details of their tenants and domestic helps, including their local and permanent home addresses, attested photographs and photo identity cards to the respective police station within 10 days. These documents are required to verify their antecedents and home addresses from the police stations of the districts concerned. The District Magistrate has also directed the RWAs and controllers of housing societies to get CCTV cameras installed at the entry and exit gates of sectors and societies. These orders come in the wake of certain incidents of crime which occurred in the recent past in the district wherein crimes were committed by the tenants or domestic helps. These orders have come into force with immediate effect and the violators will be punished under Section 188 of the IPC. The orders maintain that use of fire crackers and explosives may endanger the Ammunition Depot as it is situated in close proximity of several party lawns and gardens. The Joint Commissioners of the Municipal Corporation of Gurgaon and the SHO concerned have been directed to ensure that the prohibitory orders are strictly complied with. The orders have been implemented with immediate effect.